Already a user? Please use the login box! Need to register? Do it today and help your PEO stay in compliance with state regulations. Start avoiding preventable state citations and fines today! Important: eCAL is a tool to help PEOs and their trusted advisors identify, schedule and manage the completion of state PEO regulatory compliance tasks in an efficient, reliable and secure manner. eCAL does not cover all aspects of a PEO’s obligations and responsibilities under applicable city, county, state and federal law. eCAL does not render legal advice and is not engaged in the practice of law. If you have any legal questions regarding these requirements or the applicable laws, you should consult an experienced industry attorney. eCAL is not a substitute for the advice of an attorney. APEC is providing a “Free Use Period” for all PEOs through June 30, 2014. During the “Free Use Period,” APEC will provide each PEO subscriber with system setup assistance and user training at no charge. Subscription fees are more than offset by the savings in staff time and avoidance of agency citations and fines. 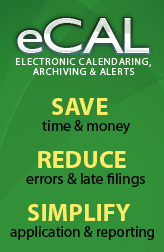 Sign up today and learn how eCAL can streamline your PEO's compliance!